Contact us to book your game changing experience, golf school, your gift certificate or for more information. 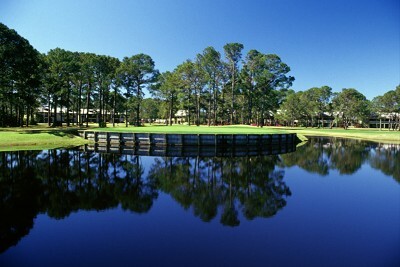 Have you ever stood in the middle of the fairway and your next shot was topped, hit fat or hit into the water? Have you ever stood on the tee and hit driver after driver into the trees, or topped or popped up a driver? Have you ever been just off the green and still failed to get your next shot onto the green? These shots are what myself and Mark Broadie would call “awful shots”. Mark is a Columbia University Professor who wrote the book “Every Shot Counts.” Broadie has had access to ShotLink data, which has tracked every shot on the PGA Tour since 2003 as well as amateur players since 2005. Broadie’s numbers show that the golfer whose average score is 105 has 4 times the amount of awful shots as the player who averages 80. When I speak with parents, junior and adult golfers about their rounds, almost everyone states, no matter the score posted, that what hurt their score the most was putting. Part of this is due to evaluating putting by simply adding up how many putts per round the player had. This is a very deceiving stat for several reasons, such as the amount of putts per round has a good chance of increasing when more greens are hit in regulation. As I speak with my students and drill deeper into the numbers, the true issue begins to unfold. Almost every time we ask the golfer how he or she took a double bogey on a hole, we get answers such as, “I was 140 yards away in the fairway and hit my 2nd shot fat or thin, and then hit my 3rd shot into the bunker, 4th on the green and 2 putts.” This is not to say that one does not ever have unforced errors on the green by 3-putting, but compared to the awful shots, it is not as devastating. Further supporting this concept is tap-in putts from inside 2.5 feet. How many of these types of strokes do you have during a round of golf? Again, for years, it has been said that 60% or more of your shots are taken from inside 100 yards. If you subtract the tap-in putts, then just 45-50% of your total shots will be from inside 100 yards. Do the percentages change due to the handicap of the player or the score posted? The answer is actually no. The next time you play, put this to a test with your own scores and see how close you are to the percentages. Tour stats are online, so look at your favorite player and apply this concept and see how close the Tour players are to these percentages too. The key takeaway from this is that a golfer can do a ton of damage from tee to green, but only so much damage once on the green. There is much more that can be written about this topic, which we will do in the future, but there are some things that can be taken from this research to assist golfers with their improvement. At the end of the day, the quality of the player lies with the quality of their ball-striking. When the player can improve the quality of the strike, then the direction of the ball can be more readily addressed. This process then can provide the golfer with more opportunities to have more 1-putts and fewer 3-putts. It likewise creates a scenario where the “awful shots” can become manageable shots so that a big number is not written in that small box on your scorecard. All the new shiny equipment does not and cannot compensate for poor technique. It may give a player a sense of confidence, where they have fleeting moments of grandeur, but soon this dissipates, and then the search continues for that new piece of equipment. The road to improvement is a process that takes an investment of time, implementing a plan of attack for improvement through constant supervision, and assuring that what is being asked of the player is being practiced correctly. If not, just like the one-off lesson or the next month’s golf magazine tip, one is left constantly searching but never truly developing a newer and better habit to lay on top of the old. The old habit is still there, but a new one needs to be developed that layers on top the old and then keeps the old habit suppressed. Again, we are not saying that one should not work on putting, but my hope is that this assists golfers in working on the key elements that directly affect putting rather than making putting into a difficult trigonometry equation. Also, we emphasize that you should work diligently in mastering putts from 6 feet and in, as well as spend most of your pre-round time around the green, inputting data into your computer (brain) about the speed of the greens and how receptive they are with short shots around the green. By doing so, your scores have no other choice but to go down. 1. Work diligently to master putts from 6 feet and in. 2. With short chips and pitches around the green, work diligently to get them within a 6 foot circle on your first attempt. 3. When possible, always hit the shot that gets you closest to the green on par 5s. 4. Train to be both physically and mechanically fit so you can hit your driver for distance, as this is the determining factor (more so than accuracy) in positioning yourself to hit approach shots closer to the hole. "If you can't putt you can't score, but if you can't drive you can't play." - Mark Broadie. 5. Lastly, below you will see a button named "View Previous Tips of the Month". By clicking the link, you will be taken to tips, suggestions, and drills that may address what ails you with your game. A special thanks to Mark Broadie for his research. If you have any questions about this article, previous tips of the month or any other aspects of your game, please do not hesitate to use the contact form below. I will be more than happy to answer your questions. Have a great day and Good Golfing! What’s the #1 predictor of you shooting in the 70’s, 80’s or 90’s? When you evaluate the reasons as to why one golfer averages 80 per round compared to the person who averages in the 90’s what do you note as the difference? What skills or what shots separate one level of golfer from another? Is it putting, driving accuracy, iron play? These questions were the subject of two papers at the World Scientific Congress of Golf a couple of years back – one by L.J. Ricco, Ph.D. at the First Congress and one from Mark Broadie of Columbia University at the Fifth. I do not think that what they discovered is necessarily earthshattering but none the less it is very insightful information that can serve to answer some questions as to why you score what you score. Pars: Golfers who average 0 pars per round have an average score of 103. Golfers who average 1 par per round shoot 99. For 6 pars per round, it would be 87. Birdies: One birdie per round, on average, is worth 6 strokes off the total. This is a reflection of skill development and as your skill set improves so does your overall good play. GIR (Greens in Regulation): The number one factor that can predict score is Greens in Regulation. In fact, GIR alone can account for 93% of the variation in score across all levels of golfers. Each GIR is equal to two strokes off the average score. There are three areas that can assist golfers in hitting more greens in regulation. Together, let’s address these three areas and watch your GIR percentage improve, and your golf scores go down. The biggest fault I see in execution of shots to hit a higher percentage of greens in regulation is poor impact with the golf ball. The lack of good quality impact, as it pertains to the golf swing itself, that I witness on the lesson tee is due to the player’s poor and strike of ground in relationship to the golf ball and poor strike of golf ball in relationship to the sweetspot on clubface. Poor strike of ground in relationship to the golf ball creates all those dreaded fat, thin and topped golf shots. Each one of these shots doesn’t go the intended distance and thus missed greens. Poor strike of golf ball, in relationship to the clubface, creates shots that can open and close the clubface and greens can be missed right and left. Also, not hitting the sweetspot of the clubface will lead to a reduction of distance so again greens will be missed short. The Gate Drill - Place clubhead on the ground. Setup a tee just outside the toe of the clubhead and just inside the heel of the clubhead. Between those two tees imagine a line on the ground which we call the impact line. Make swings with the intent of making the first contact with ground be on the impact line. The second intent of the drill is for the clubhead to miss the tees as you swing. By doing so you would then be hitting the golf ball on the sweetspot. While performing the drill you want to feel what you are doing from fingernails to toenails. Avoid going on automatic. Stay engaged to the task. Switch back and forth between doing the drill and hitting shots. Also hit shots with a golf ball in between the tees. Observe how your manual dexterity improves and the strike of the golf ball. Not everything is complicated and hard. For example, it takes very little effort to know the exact carry distance of each club in your bag. I encourage you to monitor this constantly and create a chart for ease of reference. By knowing your carry distance you will improve your confidence, in pressure situations because you will not be second-guessing your club selection. Now you can put your total thought into executing the task at hand and playing the shot to the best of your ability. It is very important for you to not only track your distances at your practice sessions but more importantly, you need to track the distances on the golf course. Why? Because range balls do not fly as far as the ball you would use on the golf course. THE #1 conclusion is HIT THE GREEN. In regulation, if you can, but if not – the next time is almost as important. The #2 conclusion: 3 GIRs break 90, 8 break 80 and 13 break 70. Since the creation of the game, and even to this day, there has been much debate about whether the head should stay steady and centered during the golf swing. The message and concept of having a steady head was emphasized in the book I authored, Purestrike – The 5 Simple Keys to Consistency, though it was not a novel idea or concept but one that was mentioned by many of the greats in the game. Those greats included Byron Nelson, Jack Nicklaus, Sam Snead, and Tom Watson. Just like the old E.F. Hutton commercials, “When E.F. Hutton speaks, people listen”, I too listen when these greats speak. But there is more to the Steady Head besides just listening to the greats. What is a Steady Head? A Steady Head is a head that stays centered between the feet from address until at least follow-through. For reference, follow-through is when the club is pointed at a 45-degree angle to the ground after Impact – and it’s the only time during the swing when both arms are straight. During the swing, your head is a steady center under which the body can rotate. Only after follow-through should your head begin rotating around until you’re facing the target. Why do I need a Steady Head? There are several reasons why a golfer should strive for a Steady Head, but today, we will address the concept that all athletes strive to have: Balance. The Steady Head contributes to your overall balance — keeping you centered over the ball and not inclined to “tip” in any direction. Imagine a camera tripod, but with a 16-pound bowling ball on top instead of a camera. If you remove or bend one of the three legs, the bowling ball will fall to the ground. Likewise, if the bowling ball drifts too far from the exact center of the three legs, it will no longer be balanced and will fall. Though golfers have only two legs and a tripod has three, moving the head — just like moving the bowling ball — causes imbalance and inconsistency. The vestibular system is a sensory system. It is a main contributor for your sense of balance and spatial orientation, allowing coordinated movement with balance to be achieved. The vestibular system, which is located in the head, contributes to sensing the position of the head in relation to the ground and the direction of head movement in space. It sends signals primarily to the neural structures that control eye movements and to the muscles that keep us upright. Head position is also a key aspect of posture. You can quickly see that the Steady Head, given how it is tied to and contributes to Balance, is an important concept in the golf swing. What happens if I don’t have a Steady Head? 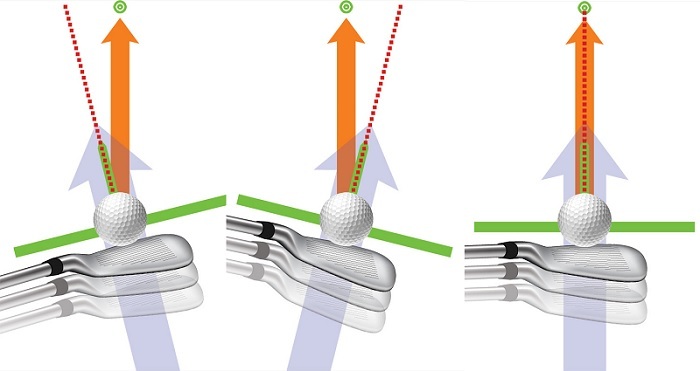 Disruption of the Steady Head leads to highly inconsistent contact. A Steady Head will provide you with improved balance and will give you a much better chance of striking the ball more consistently on the clubface and specifically the sweet spot. How do I achieve a Steady Head? A Steady Head is achieved by an overall coordinated movement pattern that begins at how we connect to the ground since we are bipedal (having two feet). This interaction with the ground starts with our feet and goes up the chain to the knees and hips. Drill 1: To get a feel for a Steady Head, face a wall and take your address position (without a club) with your forehead slightly touching the wall. You can even do this drill with your forehead against a door jamb. Now, swing your hands from address to the top, impact, and finish as you would during a real swing. This will feel very awkward if you are used to moving your head laterally or vertically during the swing, but it’s what a true Steady Head feels like. Drill 2: While outside hitting balls, stand in such a manner where the sun is at your back and creates a shadow on the ground. Make practice swing while monitoring your head movement via your shadow. So, the message here is to focus on a steady head that remains centered between the feet during the entire swing. Being able to totally control your Pivot – in this case, being able to keep your head steady – is absolutely necessary for great golf. As you work on keeping a Steady Head, remember that all progress is good progress. A head that moves 2 inches during the swing is better than one that moves 4 inches — though a head that moves zero inches is best. Keep working incrementally to eliminate excessive head movement until there is a head that is steady. If you have any questions please feel free to contact Randy. Also, if there is a Tip of the Week you’d like to suggest, please contact us. We would love to help you with any questions or problems you may be experiencing. Until a golfer gets into their head and knows precisely what they desire the hands to do, they will do it but if not the golfer is at the mercy of the hands. So, every golfer must know and then the hands must be trained. The hands are designed to do something because you desire to do it and you know precisely how you want it done. An example is that clubhead throwaway, or the bending of the left wrist, is in most golfers’ motion because the golfer is allowing the hands to do that which comes naturally. Every right-handed person who throws anything always allows the right wrist to flatten. This is why, in most cases, left-handed golfers make better right-handed golfers because they have never acquired that problem. Every golfer must train and learn to straighten their right arm without flattening the right wrist. Test this for yourself and bend your right wrist, and then straighten your right arm and note how the right wrist desires to flatten. The key then is to train and educate your hands so they know precisely what YOU desire them to do then turn them lose to perform. Like driving a car, you do not take the keys and put them into the cigarette lighter because the hands have been trained and taught that to start the car the keys need to be placed into the ignition. You do this without much thought for the hands know what you desire to do and that is, to get into the car and go someplace. The grip has to control the club. The basic precept of my teaching system is that it is a hands system. You watch your hands, the hands are the information center, communication center, and they are the only way that you can send information to the clubhead or from the clubhead. The hands are the only way that it can be done with enough precision to call it alignments. The hands have an assignment so everything else has to get out of the way. 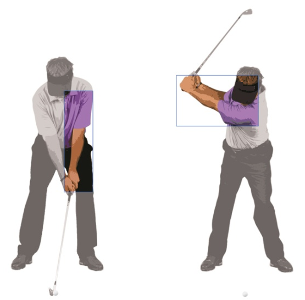 For example, in the backswing, the hands have a position where they want to go and everything is programmed to allow the hands to get to where they have been assigned to go without any interference. Let’s proceed in applying this concept and see how this can work for you. Grab a golf club and setup at address. 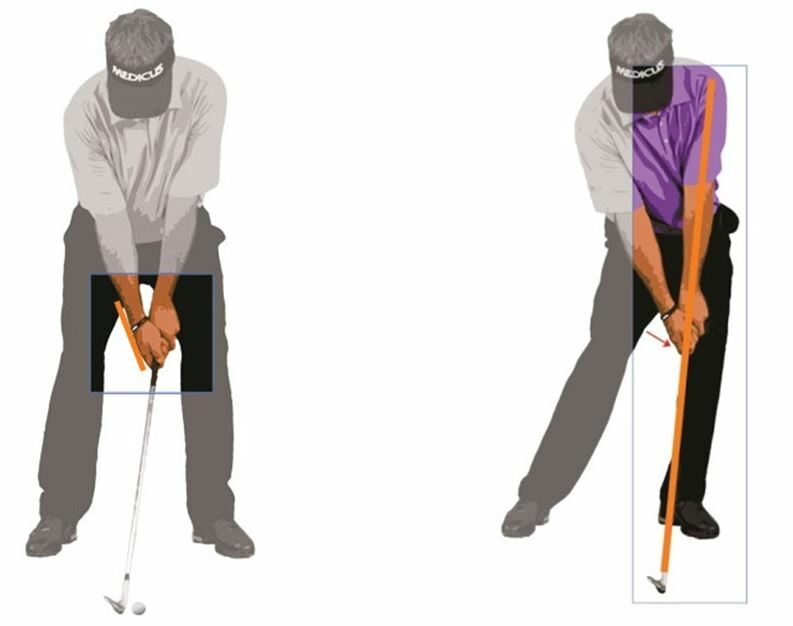 Without any thought to your pivot or body motion, take your hands from address to the top of your backswing. Have the hands arrive where they would be just above your trail shoulder and the lead arm is relatively straight. Do so by not restricting your pivot or body motion but rather have it respond to the where you have assigned your hands to travel with the aid of swinging your arms. Note how your body, hips and shoulders, have moved to accommodate where you have assigned your hands to travel to. Note the centeredness of your swing. Note the steadiness of your head movement. Check it out in front of a mirror and if you have a video of your swing check out the differences. Most golfers are shocked at how much change transpires. This is the point where clubhead alignments and relationships are in their greatest jeopardy. Keeping the Head behind the ball is not the complete solution. You must keep the head and the Ball behind the hands. Their essential relationship is with the Hands - more than with each other. This aligns with the fact that it IS the hands which control the clubface and its motion and if you do this you control the ball and when you control the ball you control the game. The primary concept is if you train and acquire Educated Hands, where the left wrist is vertical and flat through impact, your ball striking and game will improve beyond what you ever imagined. A small side note. This does not mean that I am a proponent of holding angles but rather allowing the club to seek its inline relationship with left arm. Regardless of how many hours you spend on the practice tee hitting balls, you'll achieve only fleeting success without Educated Hands. This lack of success inevitably sends you in search of more information, which only makes golf more confusing and frustrating. Unfortunately, there are no shortcuts. 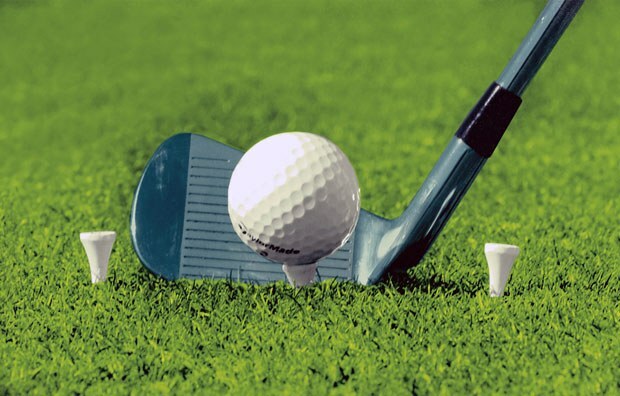 Learning to make a better golf swing is no different than learning any other physical skill, be it playing a musical instrument or driving a car. Regular training over time is the only path to mastery. With the preceding information, it is my job — as the coach — to inform and explain. Now, it's your turn — as the student — to absorb and apply. Yes, this all requires some training to master, and there are no quick fixes. But at the same time, I hope you find it refreshing to know that golf doesn't have to be impossibly complex? I hope the information that I provide you will bring you lower scores and increased enjoyment playing the game. To book your game improvement session, or if you have any questions regarding how I can assist you, please do not hesitate to contact me. Until then….Good Golfing! 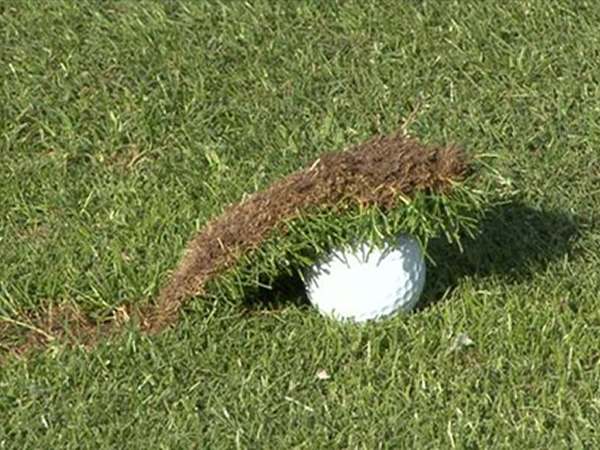 The first rule of playing golf is…don’t lose your ball! This means no penalty shots—no shots out of bounds, no unplayable lies, and no balls in the water. 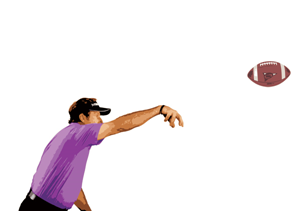 And the second rule is…for every bogey you make, you need to make two birdies! Why two birdies? Because making only one gets you right back to even – and for tournament players, that isn’t good enough! A lot of players will tell themselves, their friends, and even their golf instructor that they hit it great on the range but can’t keep the ball on the golf course when they play. You must be able to focus so that when the proverbial “bell rings,” you see ball, see hole and hit ball in hole. The majority of players find it hard to take their “range game” to the course. This is because they often lack the “know how” to do so. At Purestrike Golf Academy, we see golfers every day that are scratch players on the range but 30 handicappers on the course. They can stand on the range and hit even the smallest targets while working the ball left, right, high or low. They have the hands of a surgeon and can make the golf club do whatever they desire. Yet, they lose it all when they step up to the first tee. You must learn to separate practice from play. Practice is time for observation and adjustment, and to focus on the components of your swing. Where the ball goes can be immaterial. Playing is time for concentration, discipline and execution of the shot at hand—where the ball goes is of the utmost importance! For example, imagine you are hitting a pitch shot to the green. You make a practice stroke that would produce a high-trajectory shot, but then you step up to the ball and decide to play a low-trajectory shot. You’ve miss-programmed your computer (your brain)! When this happens, you more than likely won’t be able to execute a good shot. You’ll end up skulling the ball and hitting it over the green. The biggest key to playing golf is to eliminate swing thoughts on the golf course. I am not saying that you shouldn’t think about each and every shot—you should—but all of your thoughts should occur prior to hitting the shot. You are programming your computer to respond how you want it to. Better players never think about striking the golf ball, but rather about what type of motion they want to make to produce the desired result. Never try to make a shot, but instead focus on making a motion and let the motion make the shot. Watch any of the world’s best players and you will see them make practice swings before every shot. They are doing four things. However, I don’t call it a “routine,” and for one simple reason: no two shots are alike. Since every shot you hit is different in one way or another, each one of them must be programmed individually into your computer. Hitting a shot that draws is certainly different than one that fades, so the pre-shot is different. This brings us back to the pitch shot example above. If you wish to hit a high shot, then program a motion that produces a high shot. If you want to hit a low shot, program the motion accordingly. There is a process for each shot. If it is followed, success follows shortly after. Assess the shot—this includes the type of lie, type of shot being played, weather conditions, course conditions, design of the hole, pin placement, choosing the club for the shot and how you are feeling that day. Pre-shot—programming for the type of shot at hand. If it is a “stock” shot, then rehearse that shot. If it is hitting something other than a “stock” shot, rehearse the motion that will make that shot. Setting up to the shot—most missed shots are “missed” at address due to improper programming. This includes your stance line, grip to clubface relationship, clubface to target line relationship, hands to the ball relationship, posture, ball position, etc. I’ve said it before, but I’ll say it again—it takes no athletic ability to set up properly; at address, anyone can look as good as any tour player. Also, I’d again like to recommend that you find an intermediate target between your golf ball and the starting line of the shot. Ideally, this intermediate target would be within your peripheral vision so that you don’t have to turn your head to see it. Striking the shot—this is where it all can fall apart if you are having swing thoughts. Remember, all of your thinking should be done in pre-shot, and the swing itself is time for execution. See ball, see hole, hit ball in hole. This post covers just a few of the things that will make a difference in your ability to take it from the range to the course. As I tell all of my players, you will from experiences—both positive and negative. You’ll store this information in your computer, and draw upon it when the time comes to access it to help you make on-course decisions. Regardless of how you play on a given day, your computer is gathering and processing data at a speed we cannot comprehend. This data then goes into a vast storehouse of information and sits there, waiting to be accessed when you need it. It is imperative that you learn something from each round you play. Whether it is about course management, a particular swing thought or a strength or weakness, we must never stop learning from our experiences. Thank you for your time and consideration. I hope this tip helps you with your game whereby more joy is derived from playing. If you have any questions or have a golf swing fault or tip you’d like me to cover, please drop me a line. Have a great day and good golfing. :44 - Right knee straightening. Gait, the way we walk, is the foundation for all movement. 1:17 - Top of backswing has the greatest amount of pressure into right side of ground but quickly transitions. 1:40 - The pelvis, the launching pad, makes a very positive lateral shift left or towards the target. 2:05 - Left knee more bend or flex than at address and almost on top of left foot. 3:24 - Pressure into the ground left is coming more from above rather than gliding or sliding in. 3:33 - Pressing and getting off the ground. 3:57 - Strong balanced finish like a world champion gymnast sticking the landing. Over the years I cannot count the number of times that students have referenced Ben Hogan in the classic book “5 Lessons” regarding the hips. On page 90 it’s as if students read the first sentence of the second paragraph and stop there. The first sentence states, “The hips initiate the downswing”. Unfortunately, I see students with a whole lot of hip spin out that can lead to an array of bad motion and club delivery to the golf ball. The key to the Hogan text on page 90 is at the beginning of the third paragraph. “Turn your hips back to the left; there must be enough lateral motion forward to transfer the weight to the left foot.” In the book, these words are in all caps. This is what we see Rory, and all great golfers, do in their downswing motion and while hitting the golf ball. To begin developing the downswing motion we are advocating in this video of Rory, begin practicing the following drill. Then blend the feel of that motion into your total motion. Take your standard address with a golf club in hand. When placing, or soling, the club to the ground make sure you have a mark or tee there as a reference to ball location. Bring your left foot (lead foot) back to your right foot (trail foot) making sure you do not move the golf club back with you. 1.) Return the left (lead) foot to its original location that you had at address. 2.) You hit the ground at the precise location where the golf ball would have been located. As you swing, use the cue, which drives motor movement, “push against the left side of the ground as you hit the ball.” You will impress the golf ball. Of all the Key alignments in the golf swing, the most elusive and indispensable alignment of all is that of the Flat Left Wrist. It is the Key alignment that destroys any hopes of playing good golf. It is the Key alignment that drives golfers to the lesson tee for assistance but is the Key that usually is not addressed. When it is addressed, it is usually done so in a manner that is one of constraint and restriction rather than a dynamic and athletic motion. Without a Flat Left Wrist, or its equivalent, a golfer may have a fleeting amount of success, but sooner or later the lack of both knowledge and training of this Key will have the golfer constantly searching and never achieving steady improvement. At Purestrike Golf Academy, today and forever, this is the main theme of our instruction system. The Flat Left Wrist theme has been stated, worded and reiterated over the years and again we will do so today. If you do not consider any other mechanical aspect of the golf swing, most of you, or at least many of you, will break 90 and then 80, by simply learning how to develop the Key alignment of the Flat Left Wrist. From Driver to Putter, if you are struggling with your game, it basically stems from a faulty movement pattern and from faulty hands. You can swear on a stack of Rules of Golf that you did not bend your Left Wrist but, you can keep kidding yourself, but you cannot kid the golf ball. The only bullet-proof vest for good performance on the golf course is……a visibly Flat and Vertical Left Wrist through impact. The definition of a Flat Left Wrist in the golf swing is one that assures that the left arm and the clubshaft form a straight line. Instructors, as well as those who are avid students of the golf swing, will many times see very talented golfers who have a slight bend in the wrist. The bend viewed in this instance is one of a physical nature which still achieves the left arm and clubshaft forming a straight line. This is what is termed as an equivalent Flat Left Wrist. The Flat Left Wrist alignment is not one of restriction or constraint. It is not the maintaining of anything frozen or locked but rather freedom of movement, power and speed. It is dynamic. At address the majority of golfer’s setup with the grip end of the club pointing somewhere at the navel. This places the wrist alignments where the right is flat and the left is bent. At impact, all the greatest ball strikers in the game have their hands under the left shoulder. To achieve this alignment this requires the left wrist to go from bent (at address) to flat at impact and during the impact interval. What Makes the Flat Left Wrist a Key? It is the design of the golf club which requires that the left wrist must be flat at impact and during the impact interval. This can be seen clearly by doing the following. Take a golf club and place it on a flat surface with the sole (bottom of the golf club) flat. Observe when you perform this test of how much the shaft is leaning forward. On the lesson tee, we see the opposite of this even in a simple 2-foot chipping motion. We observe golfers who have the clubhead passing the hands which in turn places the clubshaft in a leaning back rather than a leaning forward alignment. This effectively changes the golf club, designed for striking a golf ball, into another type of instrument used to perform a different task. Many times we refer to this as changing the golf club into a “pooper scooper”. There are times when a particular specialty shot is required when the skilled golfer can manipulate the golf club and the flat left wrist alignment to achieve a certain effect. To feel the proper flat left wrist extend the shaft/grip up the left forearm. This is even better than an extended shaft smacking you on the ribs. The whole essence of golf is this. If I can help you learn to swing through the golf ball while maintaining a Flat Left Wrist, you’ll be light years ahead of the majority of golfers and well on your way to shooting lower scores. Do you desire to get better? For many golfers, though they desire to have a better game, they do nothing to change their swing. Bottom-line? It’s impossible to get better without change. Together, let’s start making the effective changes so you can develop a game that you can be happy with. So you ended up in a greenside bunker following your approach shot into the green. For many golfers, this is where their score starts to balloon as they take extra wedge shots to get on the green. Though bunkers are designed to be penal for poorly struck shots, bunkers do not have to become hazards. However, if you know the basics, contrary to what average golfers think, the bunker shot is not the most difficult shot in golf. Grip and Clubface - First open your clubface, or in terms of direction, have your clubface pointing to the right of your target. From here grip club as you would normally do for any shot. By doing so you’ll be adding extra loft to the clubface. Also by setting the clubface in this manner will allow you to “splash” the ball out of the bunker. Address - As you setup your address alignment to the golf ball, instead of being parallel left of your target line, adjust your feet, knees, hips, and shoulders slightly more left. As for the width of stance, I prefer one where the insteps are the width of your shoulders. I also recommend that instead of the pressure in your feet being 50/50 that the pressure is more into the left foot around 70/30. Due to the intent of hitting the sand first before the ball, the only time I suggest playing such a shot, wiggle your feet into the sand. Warning, if you wiggle your feet into the sand and then choke down on the club, you have basically offset the cause and effect of wriggling your feet into the sand. So, do not choke down. The Swing - With the clubface aimed right of your intended target and your body lines left, swing along your body lines the same as with your regular swing. This will provide you with an outside-in swing path or maybe better stated a more left swing path through the golf ball. What do I mean by outside-in? When you draw a straight line from your golf ball to the target, this would be called your target line. The following pictures demonstrate the 3 paths, though the degrees of variance could be many. With your setup, you have effectively set yourself up for and out to in swing if you swing along your body lines. By doing so you also don’t have to apply manipulation of the club. Aiming Point Concept - You should blast the ball out of the trap by making contact with the sand from 1-2 inches behind the ball. To do this one does not look at the golf ball. Instead, your focus should be at the spot in which you desire the clubhead to enter the sand. 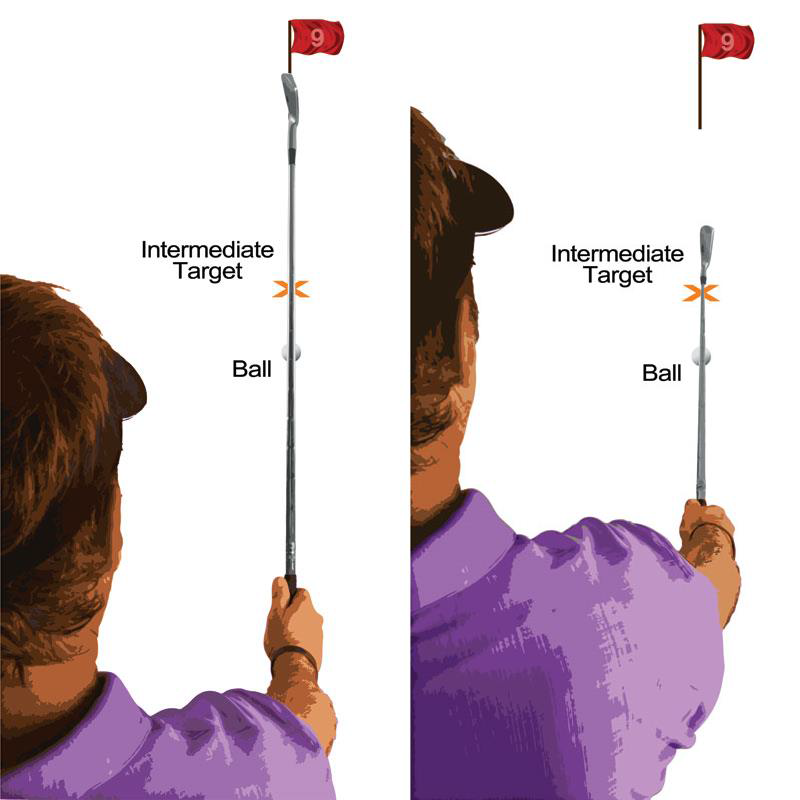 By doing so you are aiming and focusing on the spot where you want to deliver your hands and such the clubhead. Speaking of the golf ball, play the ball just forward of center of your sternum. Ball position can be moved around though so experiment with ball position during your practice session. Distance - When splashing the sand behind and under the golf ball, the ball will come out with and ride on the sand. With this being the case imagine the amount of power you would need to propel or blast the sand a certain distance. By doing so the ball will go with the sand and the ball too should carry the required distance of your intent. The length of swing will also be adjusted to accommodate the amount of power required for the shot at hand. Finish Your Swing - Many golfers struggle from the bunker because they jab at the ball and just stick the club into the sand. 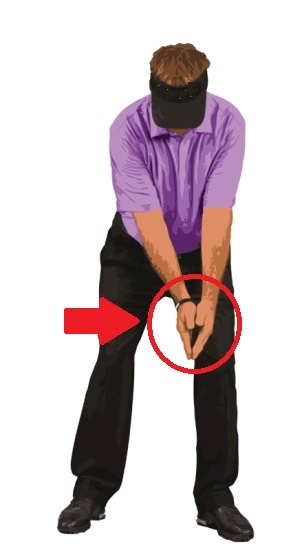 To avoid this problem make sure you finish your swing by transferring more pressure into your left foot and rotating your belt buckle to the left of the target. Avoid becoming impact happy by keeping your hands and arms swinging through the shot. If you’re having problems leaving the ball in the bunker focusing on these few tips will assist you tremendously. The above suggestions and tips will be quite helpful but to become a better bunker player takes practice. Jumping into a bunker and working on these techniques for 20-30 minutes will not only improve your bunker play but also your confidence. The residual effect of being confident from greenside bunkers will also free you up for your approach shots into the greens. In 2011, while writing the book "Purestrike - The 5 Simple Keys to Consistency", I happened to befriend Dr. Gabriele Wulf. Gaby, as she requests me to call her, is a Professor in the Department of Kinesiology and Nutrition Sciences at UNLV. Gaby studies factors that influence motor skill learning, including the performer's focus of attention and motivational variables (e.g., autonomy support, performance expectancies). Her research has resulted in ca. 200 journal articles and book chapters, as well as two books. At that time Gaby and I exchanged projects we were both working one. She was working on the research paper "Increased Carry Distance and X-Factor Stretch in Golf Through an External Focus of Attention" and myself the aforementioned book. Before submitting both our work, her research paper to the Journal of Motor Learning and Development, we exchanged both documents to read. From that point and to this day, Gaby and I exchange emails frequently and when I make my yearly visit to Las Vegas, we strive to connect. She has been a great influence on my coaching and hopefully, the cues I have exchanged with her have assisted with her own game. The below is from her work and what we shared with each other in that regard. I hope you enjoy and it assists you with your game improvement. The ability to strike a golf ball a required distance to play the golf course is dependent upon several factors. For many the distance, or carry distance, that amateur golfers strike the golf ball is such where they crave to hit the ball further or increase their carry distance. In the golf instruction industry how a coach goes about instructing the student can be implemented in many different ways. But in many cases, the words and instruction given can many times go against that which is best for motor learning. It is my belief that words have meaning and words matter. It is my belief and experience that as a coach if we provide cues that are more in relationship to the target and/or the club, not only is motor learning enhanced more quickly but also the increase in retention is likewise enhanced. So, is it possible that one single thought, swing cue or focus, can effectively and efficiently improve a golfer's ball striking whereby their carry distance is improved? Would the cue and/or words provided to the student act as a prescription rather than just a pill or quick fix? The answer is yes. The difference can be seen in the video, around the 13-second mark, where you see a spike in the red line on the left side of this golfer. Note how the red line jumps up considerably compared to the golfer up to the 13-second mark. With a particular cue and focus, we see an improvement in golfers' movement pattern and their movement outcome. We see improved factors such as GRF (ground reaction forces), coordinated movement, kinematic sequence (swinging from the ground up) and ball-striking. This translated into increased clubhead speed with the movement outcome being greater carry distance of the golf ball. How much carry distance improvement was achieved? Carry distance immediately improved by 15% but even more importantly the retention on the days that followed improved by 25% compared to other golfers of similar skill set. Why Is the Retention Aspect Important? How many times have you left the lesson tee hitting the ball better and feeling overall better about your game? Then, the next time you play or hit balls, it seems like that everything you thought you had accomplished, all those feel goods, had been for naught? This is why retention and the proper cueing for improved motor learning are so important. It is not only important for short-term but also long-term gain and improvement. Words say what they say. Words have meaning. Words matter. The most important thing for me as a golf coach is learning how to provide simple cues, instruct, provide feedback and interact with you, the golfer, so you get the most out of your game. It's not about a bunch of training fluff. Its purpose, intent, and execution repeated over and over again. In the book, I used the words of "pressing firmly down on your left foot". Gaby in her research paper used the cue of "push against the left side of the ground as you hit the ball." What are the main differences between the two cues provided? The cue I wrote in the book would be considered an internal cue. In other words, the cue used included words that had to deal with the body. Studies have shown that a focus on an internal cue causes golfers to control the movement on a conscious level. When golfers do this it constrains the motor system and interferes with the golfer to control their movement in an effective and efficient manner. Gaby used what is called an external cue. An external cue is one where the movement and environment are focused upon. This promotes more automatic control, unconscious, fast and reflex control process. The end result is that the external cue improves the effectiveness and efficiency of the movement pattern. What is significant was the difference of results as it pertains to retention of testing on day 3. In distance alone, the external cue group had a carry distance increase of 27% over the internal cue group. Over the control group, who was given no instruction, the carry distance was 32% greater. At this point is when my students usually ask for the details. Refrain from doing this because the cue will then switch from an external to internal or worse yet, no cue at all. Remember, words matter, and words have meaning. Use the meaning of the cue "push against the left side of the ground as you hit the ball." Now, head to the range or golf course and embrace the external cue concept. Implement the external cue and watch your ball fly better than you could ever imagine. Then let me know how you did. I would love to hear from you. Good golfing everyone and have a great day! What is a pre-shot routine? How important is it? Is there a right way or a wrong way to go about it? Pre-Shot, first of all, comes fully, totally and completely before any movement toward a shot takes place. Most players may not do it this way but in the end, that’s how it shapes up. This is the case if you believe in the fundamental truths of research. What I would like to offer is not an opinion or “guesstimate” based on long-lasting tradition. Consider what you may have read or heard about pre-shot routine. You may have noted a few common elements of what is being stated. Every good player has one, and if you want to be a good player, then it is absolutely necessary for you to have one. What is provided as the process is usually the same and includes 3 basic opinions or beliefs: focus on the target, align properly, and check conditions. I want to encourage you to think about it slightly different. I would like for you to think of it as pre-shot planning and the only thing routine is that it occurs with every shot. Every action we take that has any intention attached to it deserves a plan. An example could be you and your car. You load up the family for an aimless Sunday drive. Though it may be aimless, there is almost always a destination in mind. You don’t sit around and give it deep thought, nor do you focus all of your attention to the lines on the road while you head to your target. Over time and practice, you developed good driving habits that keep the car on the road without deep thought of how to steer the car. Let’s consider the first relationship I teach in golf. That is the relationship of the golfer and club to the ball and intended target. Once your brain has the intended message about alignment, you can begin your approach to the golf ball with confidence. This is due to the information that is stored in your temporary memory which will assist you when addressing your golf ball. If you have developed a sound alignment habit, you will walk into your alignment in good shape. If you walk into your alignment and have to constantly keep checking once you get there, recognize two things. One is that you have not developed the habit or maybe, better stated; you have no habit. Or, the habit you have developed is insufficient, at best, at least at this point in time. First, let’s add some definition to the process. As I always state to my students, words matter and words have meaning. “Pre” means “before.” Players are consistently instructed that pre-shot is everything that happens up until the player starts his or her golf swing and some have even filtered in the evaluation aspect following a shot. So why all the confusion regarding what a pre-shot routine may or may not be? If we look a little deeper as to the “Why’s” for “pre-shot” in the first place, almost all teachers and players know we need to “plan” for the particular shot at hand. But, there may also be some subtle underlying things going on. It may look like pre-shot is being used to plan, but in many cases, it is being used to calm the nerves. We need to be aware of this and don’t consider it being bad but, we need to be aware if we want to move on to what needs to happen in pre-shot. If you don’t know how to play, pre-shot could take on the look of being a short practice session. If you know how to play, then pre-shot can be no more than picking your goal (target) and your club. If you have not developed good habits for grip, address set-up, alignment, and the start of the backswing, good chance you’re already in trouble. If you have developed sound swing habits, there is no need for you to start self-instructing in pre-shot. Most of you will know what I mean by that. All you need to determine is where you want to go. If your swing habits are developed then “how” to get there is in place. If they are not then one needs to go back to the drawing board AFTER your game. Having said all that, here is what I recommend for pre-shot. I have to make a couple of assumptions that you have learned some things about your game and that you have developed some habits – good, bad, or indifferent. While you are performing on the golf course, the best plan is to go with what you brought to the “dance” and then work on your game after the round following an assessment and prioritizing what needs improvement. Before each shot, consider where you want to go, the path of least resistance, and any factors such as water, wind, sand, distance, etc. Next step is to pick your club and ONE dress-rehearsal demonstration of the swing you wish to make. Why no more than one? If you make more than one dress-rehearsal swing, then you are creating multiple commands to a system that can only respond to one. The system then can become confused and not know which one you want. Once you begin your walk to your golf ball you are forced, rather you like it or not, to trust the swing habits you have developed. If you have done your work and developed a sound motion, fine. If you have not, you will know soon enough. Just realize there is no fixing while performing on the course. That would be like trying to learn to drive in the middle of the Indy 500. I hope you have enjoyed this article and it assists you with your game. If you have any questions, please do not hesitate to ask. Golfers will often search for that one tip that will cure them of all their ailments and give them a brief moment of respite from all the worries that they had about their golf game. It is often said that there are no quick fixes in this game and that is true, and yet millions of amateur golfers are still searching for it. In all honesty, all the quick fixes will not help anyway as they are simply masking the real issue behind your problems. The one single biggest mistake that I see week in week out it is the failure of amateur golfers to maintain their balance throughout the swing. Being in balance and stable is not simply being able to finish your swing and hold your photo finish pose, it is required throughout the entire swing, from the very beginning to the very end of your swing. If you are unstable how can the clubhead and clubface be stable? They can’t. One of my favourite drills, tip, exercise… call it what you like is simple, useful throughout your entire golfing life and never, ever going to be useless is the feet together drill. The simplest of drills are often the most beneficial, yet many golf coaches will try to avoid giving you these drills in an attempt to “build” the text book swings, rather than a functioning swing. What many are failing to do is teach your body how to swing the club in the away that is best suited to your stature, body shape and physical abilities and limitations. It is why this drill is so important, your body is capable of maintaining balance whilst performing some of the most complex movements known to man, and in doing the exercise correctly you are handing back the control to your “sub-conscious” mind, allowing you to swing the club in the best way you can. So how do you perform this drill? Take your favourite iron, preferable a 7 or an 8 iron. Set up to the ball as normal, now close your feet so they are touching, and if you can, without physical discomfort, get your knees together. This is important, make sure that the ball is opposite the centre of your feet, perfectly in the middle. A ball placed off the centre will change the effectiveness of the exercise. Now from here, you may feel too far from the ball, if you must move closer to the ball to feel more comfortable. The exercise works best when you do not force your swing, so I always get my students to begin with half swing and a swing speed that is smooth and controlled, half speed is a good starting point. Follow through as far as you can, you should be able to go through the same distance as your backswing. The goal of the exercise is twofold. First you should feel the way your body moves and changes to maintain balance and second you should be in perfect balance at the finish point of your swing. Any swaying back or forth is a result of poor balance. Following the drill you should setup in a normal address alignment as if to hit a golf shot. Make a full golf swing and strive to maintain the feel of motion you performed while doing the drill. Make sure that you stick your finish in balance. This is one of the best and most effective drills for improving your consistency with your full swing and should never be left out of your practice regime. From this drill there are different iterations that can be added to further develop one’s golf swing and total motion. A couple of these are demonstrated in the video. If you have any questions for Coach Randy or would like to start your journey to improvement, use the contact form here. Until then….Good Golfing!